We are so excited to open our new store in Ashland’s historic Railroad district. 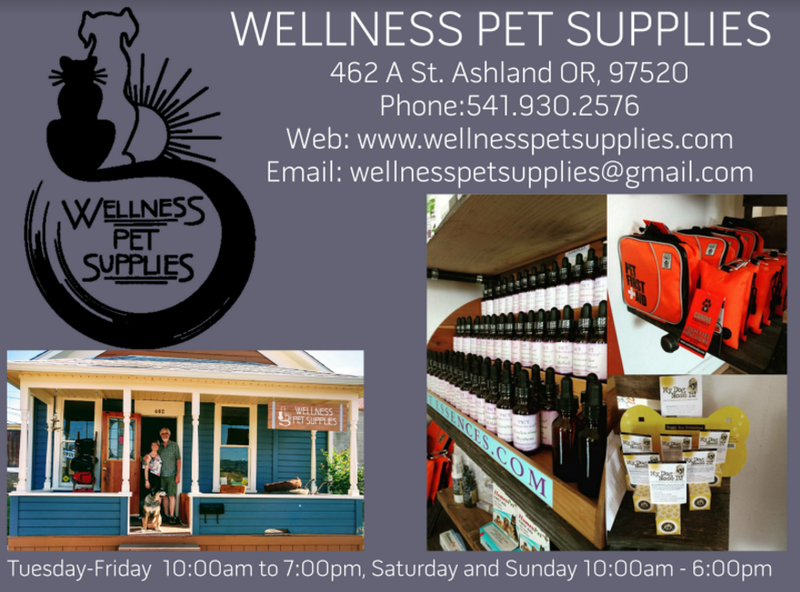 Wellness Pet Supplies is located directly across from the Grange Coop at 462 A Street. In the past two weeks of being opened we’ve received so many great comments that are “exactly the kind of store that was needed here in Ashland”. My husband and partner Doug and I are proud to not only be providing an ALL NATURAL PET SUPPLY store but one that it is filling a much needed niche for our community. Wellness Pet Supply’s mission is to provide the highest quality natural and holistic pet supplies in order to improve/maintain the health and well being of cats and dogs. By providing exemplary customer service, product information, natural medicine knowledge, lectures by pet care experts and referral services for the best pet care professionals in our area. We strive to be the trusted partner of choice for all pet parents. All of our products have been hand selected for premium quality, kindness and care to the planet and your pets. When setting out to create Wellness Pet Supplies Doug and I decided that we wanted to combine our life long interests in herbalism, nutrition and wellness. We would create a store that focuses on natural, holistic, often organic and environmentally responsible remedies, food, toys, supplies. These include health support for such issues as allergies, glandular support, arthritis, dental hygiene and emotional issues. This is possible through herbal, holistic, homeopathic and supplements. Wellness Pet Supplies carry the highest quality human-grade foods and treats. Our collars, leashes, toy’s and bedding are made by companies who take the environment and allergies into consideration. Serving the pet parents community with our knowledge and experience in pet health and wellbeing is most important to us. Just like pet parents we understand that our animals are our family and that we want the best for them. We are excited and grateful to have opened our new business here in Ashland. Together we look forward to getting to know you and your pets. Please come in and introduce yourself.